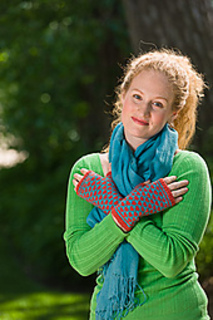 These fingerless mitts feature a sweet two-color pattern of tiny hearts worked from a chart. 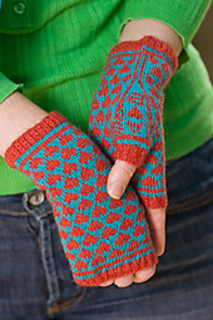 The “I (heart) U” pattern on the thumb gusset is customizable so that you can draw any initials into the chart with the alphabet provided. Yarn Knit Picks Palette (100% Peruvian highland wool; 231 yd 211 m/50 g): #24247 raspberry heather (MC), 1 ball; #25095 Caribbean (CC), 1 ball. Needles Size 2 (2.75 mm): set of 4 double-pointed (dpn). Notions Marker (m); tapestry needle; waste yarn.